I love food. I love trying new food. I love eating locally sourced food and if it’s homemade, well, that’s me sold! Our last trip gave us a taste of Orkney that has definitely left us wanting more. In this post I am going to share with you some of the divine food and drink we came across. We caught the 08.45 ferry from Scrabster to Stromness and thankfully it was plain sailing. Ninety minutes later we arrived at the pretty ferry port and it was time for brunch. It seemed a little place called Julia’s would be perfect to watch the world go by and we were right. The obvious choice on this occasion was scrambled egg and salmon on toast. Lovely fresh yellow eggs, so light and fluffy, brown bread (from the bakery we were to visit later) and the tastiest salmon we have ever eaten. We chose to take a tour of Orkney Brewery, (well it would be rude not to as it was a two minute walk away from our cottage) followed by a late lunch. 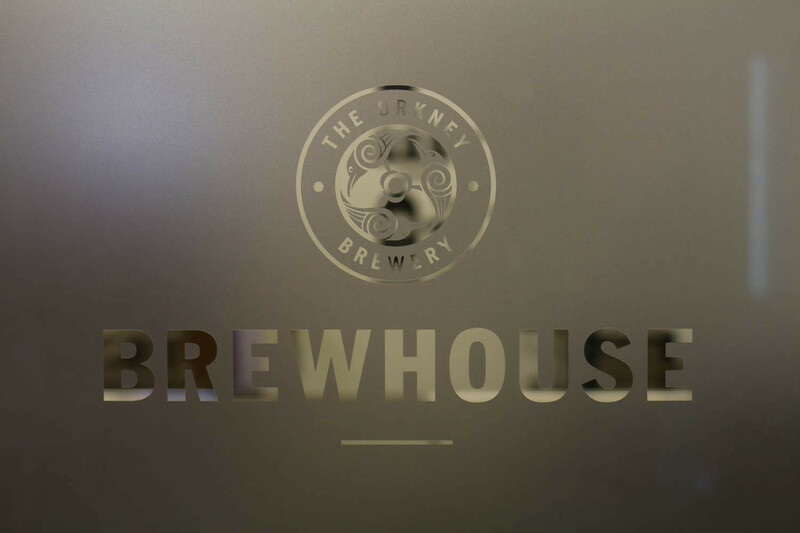 The oldest part of the brewery’s building used to be a school and the Tasting Hall (bar and restaurant area) reflect this tastefully. All the tables are old school desks and there are photos on the walls too. Even the toilet doors have Prefect badges on. The menu is brilliant and has choices of nachos, salmon salads and soups to start. Sandwiches and burgers – both with veggie options. Seafood, cheese, brewer’s and vegan platters too, offering local salmon, herring, mackerel, cheeses, chutney and beremeal bread. 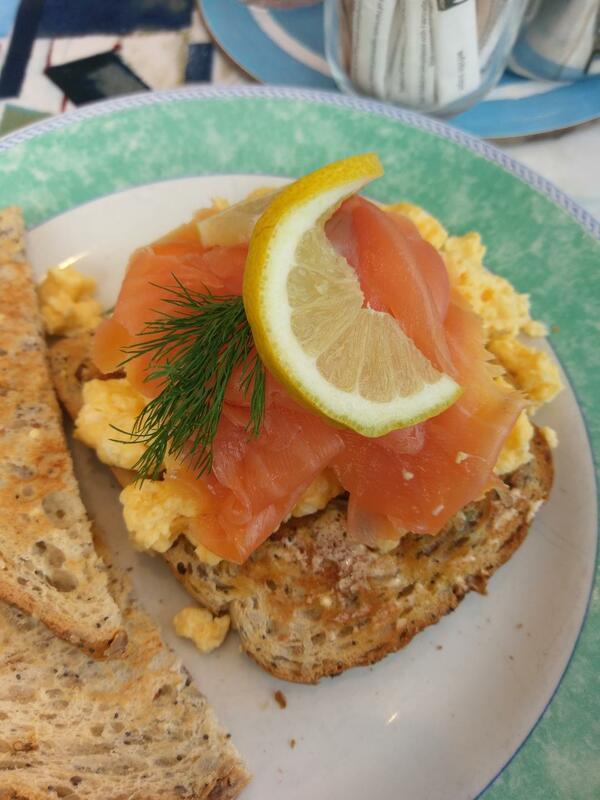 We opted to share a starter and chose hot smoked, smoked salmon with oatcakes and beremeal bread. The fish was super tasty. 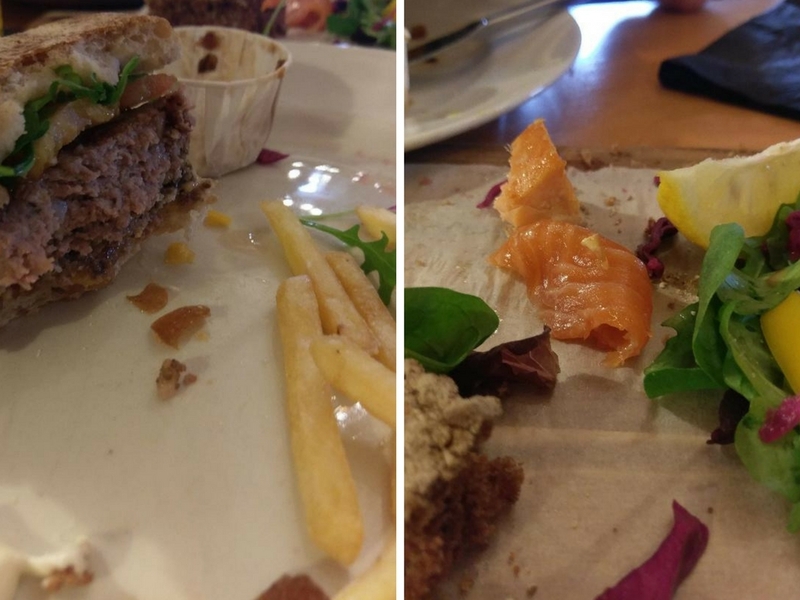 Having seen a couple of different burgers go out to neighbouring tables we decided that burgers were the way to go. 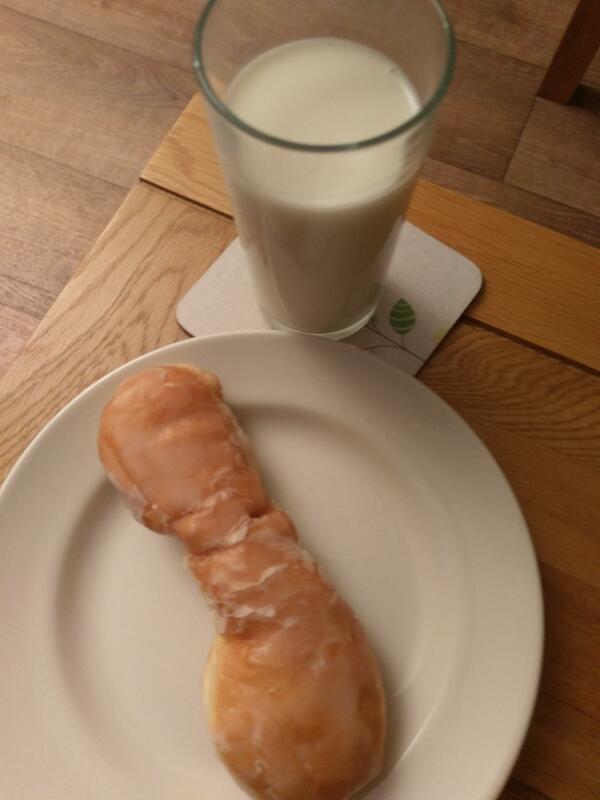 And the photos below will prove why I shouldn’t be a food blogger! I got three quarters of the way through and thought ” Ahhhhh, yeah, I might need a photo of this food for a blog!” So my apologies for my phone photos of half eaten food! My bad. I’m pleased to report that they were really tasty and were polished off. It’s not far from Skara Brae and the Ring of Brodgar so well worth a trip if you are out that way. I’m not a huge fan of spending hours and hours trailing around huge department stores or chains of shops and so visiting Kirkwall was really refreshing. Some fabulous independent retailers with quirky or unique clothing and jewellery. Whilst wandering the narrow streets we saw several cafes, a chocolate shop, pubs and coffee shops – all very enticing. We popped in to Judith Glue’s shop and cafe, which is directly opposite St Magnus cathedral. The cafe is right at the back of the shop and gets really busy but we managed to get a table to have a hot drink. It’s a popular place with locals eating their too from what I could make out and in my book that is always a good sign. The menu was full with locally sourced produce and so has very few food miles (always a good thing). Last year when I visited for work, we ate in here and enjoyed soup and a sandwich. I remember the generous portions and how tasty it was too. We enjoy being in self catering accommodation because it means we can please ourselves and use local shops for our shopping. We stayed in Quoyloo this time and used the shops in Dounby, just a few miles down the road. The butchers there was an absolute gem of a find. We chose rib eye steaks and the lady told us they were bred just down the road and we paid just £10 for the two. To me, that’s a bargain! Of course, as with everywhere else we have been we got chatting about where we are staying, what we had planned during our stay and got some local tips of other places to visit. You won’t get that in your chain of supermarkets! In Stromness we also discovered a fruit and veg shop too, all the veggies outside and it was great to see that some were wonky and even had soil still on them – adding that little bit extra for supporting an independent business. Also in Stromness after walking out to Ness Battery we couldn’t resist and followed the smell of freshly baked bread into the bakery. A complete assault on your senses with the fresh bread mixed with the sweetness of the cakes and pastries. We came out with morning rolls and an iced yum yum (for later). Another brilliant find. At our accommodation a welcome pack had been left for us. 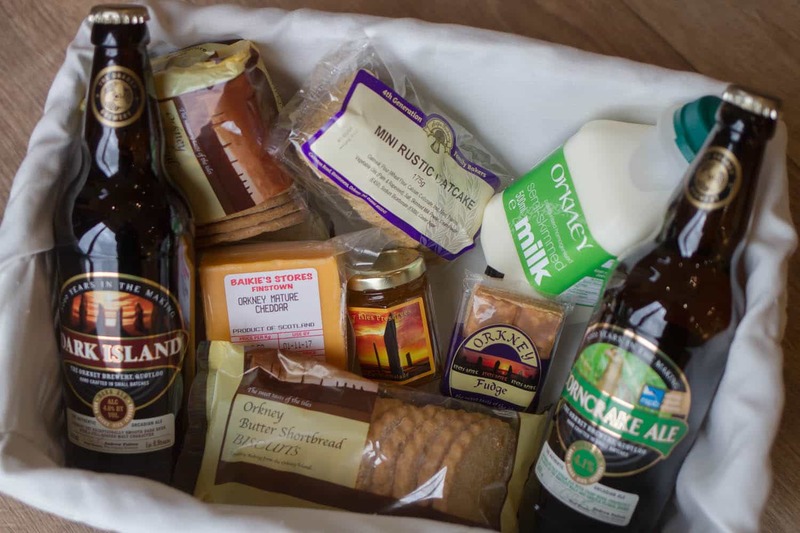 It included – fresh milk, marmalade, shortbread, two bottles of local beer, cheese, oatcakes and fudge. All of it from businesses in Orkney. Some of which have come back to Perth for us to continue enjoying and a great holiday memento. Earlier on I mentioned Orkney Brewery and the Dude has taken quite a shine to a couple of the ales made at the micro-brewery. They do lots of different pale ales, stout, bitter, blonde lager and even seasonal tipples. 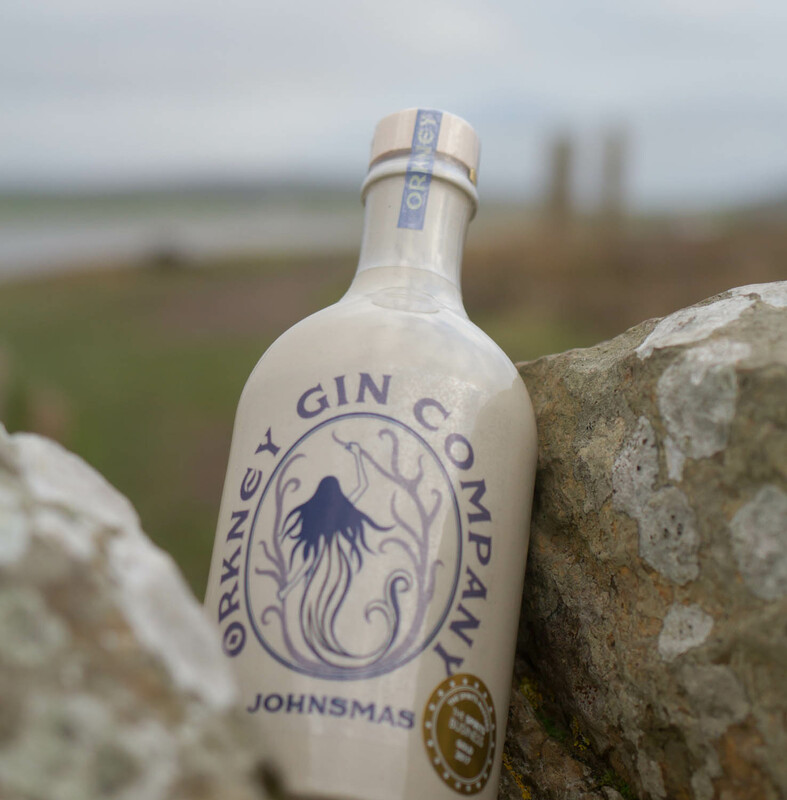 Last year whilst visiting for work I discovered Orkney Gin Company and their Johnmas gin quickly became a firm favourite in our house. The bottles are pretty with the selkie-woman logo and with it’s fresh, light floral taste, perfect reflection of the Orcadian summer days. Mikklemas is a warming drink which is spicier but still smooth (so, I’m told – I’m not a fan of spicy drinks). For those of you that follow me on Facebook you may have seen earlier in the year that I had one bottle of Rhubarb Old Tom to give away. I managed to get my hands on a bottle at the Royal Highland Show and fell in love with it paired with ginger ale. During our visit we popped out to the Orkney Gin Company HQ and were treated to a sneak peek of the new premises which will be ready very soon. 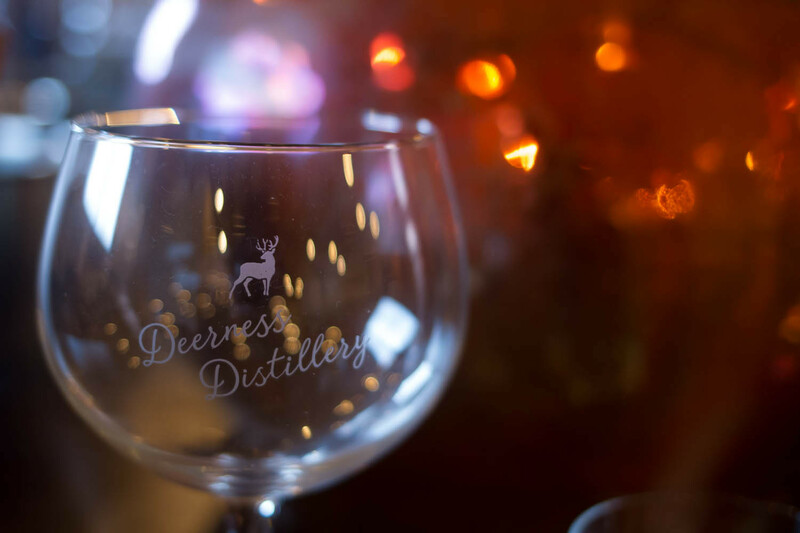 The newest of the gin distillers is based out at Deerness and whilst in Orkney we were lucky enough to go and visit them. With THE most stunning view Deerness Distillery maybe the new kids on the island but they have some big plans. They already stand out from the crowd because they also make vodka and a coffee liqueur is in the making (and it’s good!). We met Stuart, an Australian who has now made Orkney home with his family, he spoke to us about being able to grow the botanical components just outside the distillery. I really like this idea and it certainly cuts down on any food miles. 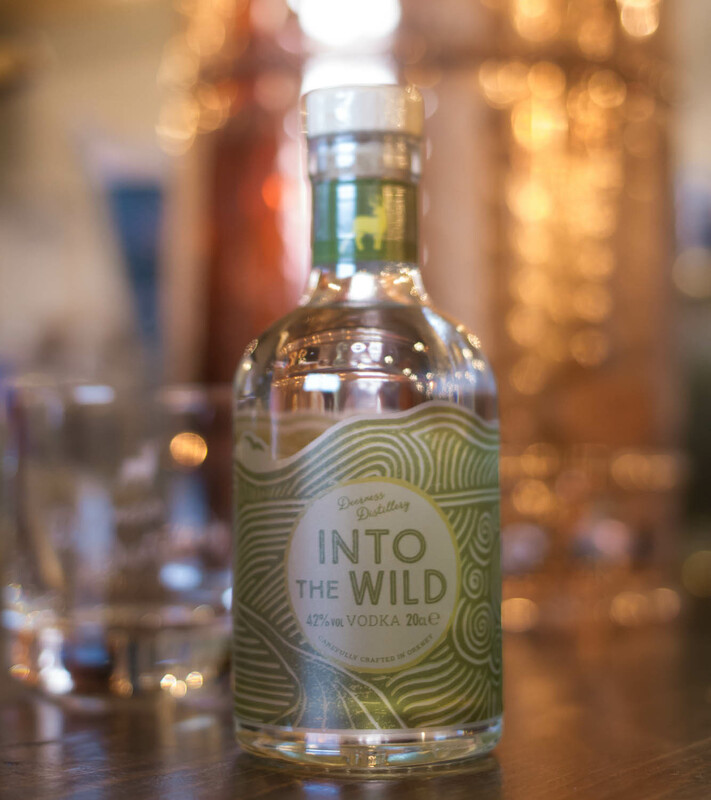 Both bottles of Seaglass gin and the Into the Wild vodka bottles are really pretty and make a great addition to any gin collection. Another thing I like about the Seaglass gin is that there are several pairing suggestions given: kiwi, coriander, lemon or blueberries. I have also put cucumber in mine and it’s REALLY good. In Scotland you are never far from a whisky distillery and this rings true here too. Located just outside of Kirkwall is Highland Park and Scapa distilleries. It is always best to book in advance if you wish to have a tour, especially in the summer months but in late October we were joined on our tour of Scapa with just two other ladies. Tours will vary in length, depending on how many questions are asked etc and you would normally receive a wee dram to nose/taste at the end of your tour too. I don’t drink whisky but I always find the tours interesting and to learn some of the history too. The Orkney Wine Company at Lamb Holm (near to the Italian Chapel) produce wine, port and recently released rum too. They pride themselves on 100% natural products, that are suitable for vegetarians and vegans. Sadly we didn’t get to visit these guys but I have spotted some great gifts on their website. Of course, there are more food and drinks producers, growers, distillers in Orkney, these were just a few that we had come across during our stay. I just love that so much comes from these islands and that people share gems like these with visitors. I wanted to give you a taste of Orkney and hope you are not drooling too much. If you enjoy excellent food and drink then I suggest you get yourselves on the ferry and explore this foodie heaven. You’ll love it. ALL of the booze!! I can’t wait to visit Orkney when we’re in a position to do so – hopefully next year. And we will definitely be checking out your food and drink recommendations – especially the drink ones!